Sixth and Ellsworth: The signal and posts look and work fine, but ODOT says they are outmoded and must be replaced. The council is scheduled to award a $336,181 contract to EC Company to build a full-fledged traffic signal at Sixth Avenue and Ellsworth Street. Together with design costs and other expenses, city engineers estimate the total project cost at $470,500. For decades, a signal has stopped traffic on Ellsworth with a red light when fire trucks or ambulances from Station 11, one block east on Lyon, came along Sixth in reponse to an alarm. In January 2017, the council and other members of the advisory board of the Central Albany Revitalization Area were told that this signal would no longer be good enough, even though it has worked just fine. The curb ramps at the corner were going to be modernized as part of the downtown streetscape project. This meant the signal would have to be replaced because it no longer met ODOT standards. 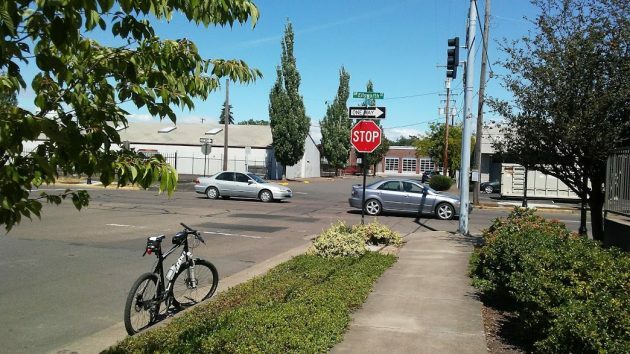 The upshot: A full-fledged traffic signal to control traffic on Ellsworth and Sixth. And because ODOT won’t allow a signal to be dark, it will operate all the time, not just when he fire trucks roll. When the units do roll, operators can turn all the lights to red. Time and time again ODOT continues to show they’re some the state’s experts at spending other people’s money with the attitude of “necessity be damned”. We are ODOT. Resistance is futile. Prepare to be bullied into submission. Well said Ted, and thank you. There’s too many fleas on the dog, which is fine for the fleas but not so good for the dog. I agree, this is not needed! Personally, they should put the money towards more paving repairs of our horrible city streets. Sort of interesting that the unneeded signal is going to cost more than the block grant to help create affordable housing and mitigate blight. Wonder what the administrative costs are for the signal project. If the traffic light is not needed, tell Rep. Olson and ask him to attend the ODOT Commission meeting together with Albany city council members to protest the unneeded traffic light. As for a study before proceeding .Government needs to set priorities in spending hard earned tax dollars. ODOT has no reason to act like a dictator. If they don’t behave, gas tax increase proposals will never pass. I don’t necessarily have a problem with putting in a light. But I find the cost of doing ANYTHING construction wise ridiculous! How in the world would this cost $500K for something that seems to be a 1 day job? North Albany had a bid a while back to put in a stop sign… $50K. Yes, a pole drove into the ground is $50K…I just don’t understand the costs involved with this kind of stuff. Traffic Signal. But, it would ruin the street for the people on 6th with all the traffic that would use it to get across. Here’s an article from a news site in Illinois that does a pretty good job of breaking down the expenses of installing a traffic light. There’s a lot more to it than you’d think. Still, I don’t see a reason to install one there other than to justify high budgets. Part of sixth street was demolished and built over by the new fire station building, I thought? I don’t understand the need for this new traffic light at all. Is it just because the City/CARA wanted to spend on those bulb-outs, not just downtown, but clear out to Central School area? Perhaps a good old fashion time “honored” revolution is needed. Those in our current government think they are “vested” & have no need to heed!! !